wow! 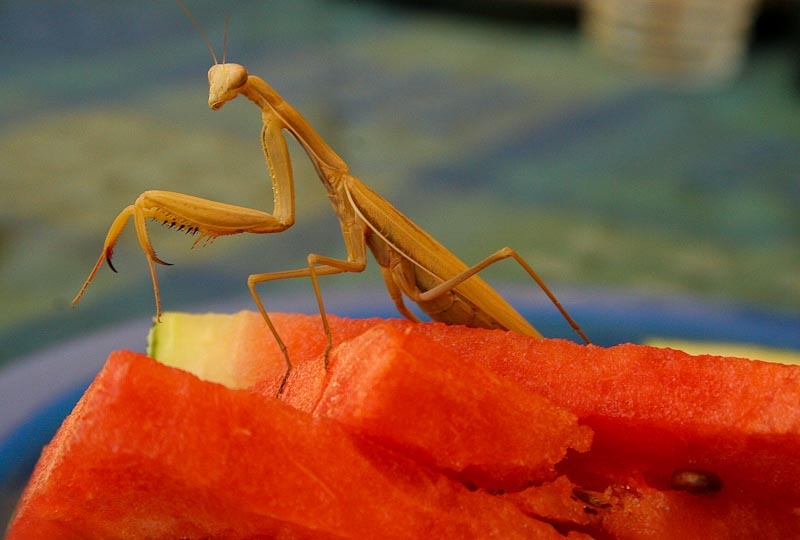 The red of the watermelon makes the praying mantis look carved out of wood or made of bamboo. What contrast. Wow, the colors are amazing. I've only seen green Praying Mantis. Stunning macro. Love the details, beautiful macro! c'est magnifique !!! bravo ! That is just magnificent! Who would have though a mantis would fly right onto a watermelon, great shot! This is such a remarkable creature. It appears as if is thinking, planning and now turning it's head to ask you what you think too. Incredible image! Extraordinary detail and capture. Must have been fun to find him/her perched on your watermelon!!! Color is amazing. And the bug does look like a weirdly beautiful wood carving. Nice! Your patriotic predator seems to be looking right back at you. His body in that color is a true summer treat. Let's hope he returns for more guest shots. Crazy capture! Definitely a good one. What an amazing creature. You did well. i love this! i've never seen a brown one. but, they're all so crazy looking. this is intensified by it walking on the bright red watermelon. Holy smokes! I am note sure I would appreciate such a guest.... A wonderful, unique image!! A fun, and fierce, image.